Welcome to Quiltmaker's 100 Blocks Volume 12 Blog Tour and My Day to show you my block Stripped Chevron. It's the moment I know you all have been waiting for; I know I have been so excited to show you. I've had to keep this secret a long 6 months and you know how I hate to keep secrets! It's been a fun week of touring all the fabulous blogs to see what everyone is doing with their blocks. This is my block. It's #1194 on page 55. When I made it, I made all my half square triangles first, then my quarter square triangles. Then it was easy to set it together in the rows. My first block layout looked like this. Four blocks across and 5 blocks down. It makes a nice throw size 48" x 60". 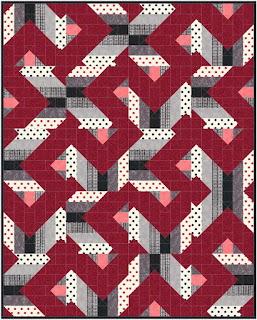 Of course you can add borders to make the quilt larger or add more blocks too. I wanted the quilt to have a more modern feel so I left the borders off. And this is the "real" quilt. Much, much better for me! Of course you know I had to play with some red/white/blue fabrics. Then I played with flipping the blocks in the second and fourth rows. The block on the left is the original block and the block on the right is "flipped". 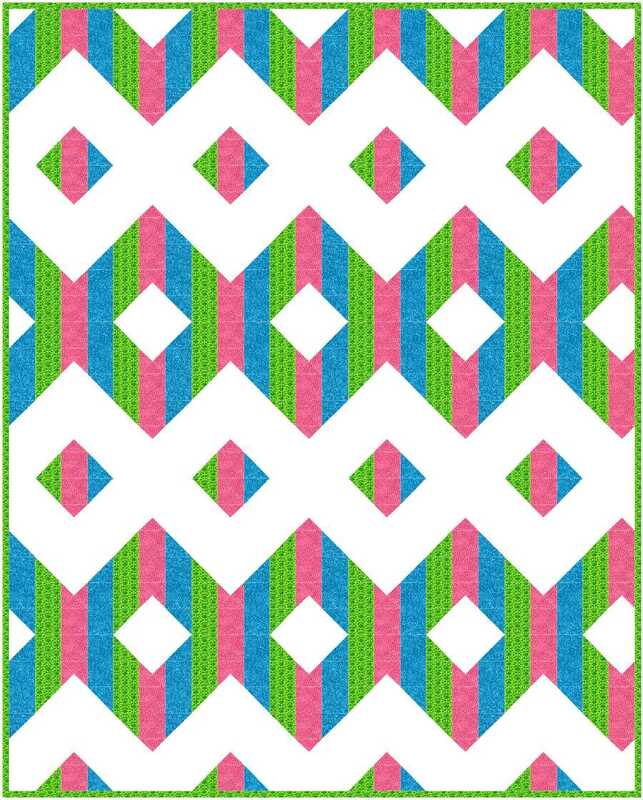 A bright, fun color way with the flipped block layout. And then I got a little crazy with rotating and flipping the blocks. (It was late at night; what can I say?). I really like this wild and crazy one. Have fun and play with the block. There are 99 other blocks in this issue to play with as well. 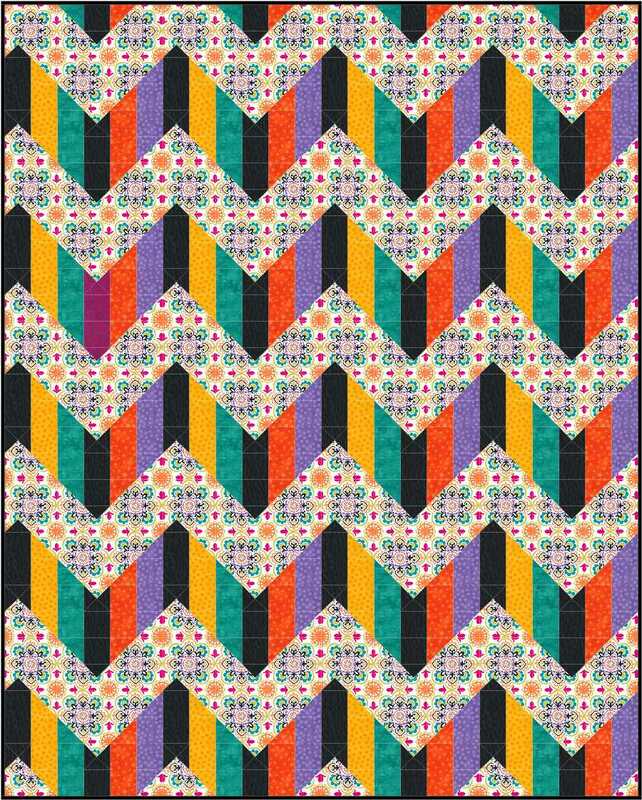 Have you been making all the Bitty blocks that are being featured on Quilty Pleasures? Aren't they the cutest little blocks! I humbled and thrilled when Diane at Quilty Pleasures ask me to design one for the Blog Tour. You can find it and the directions here. 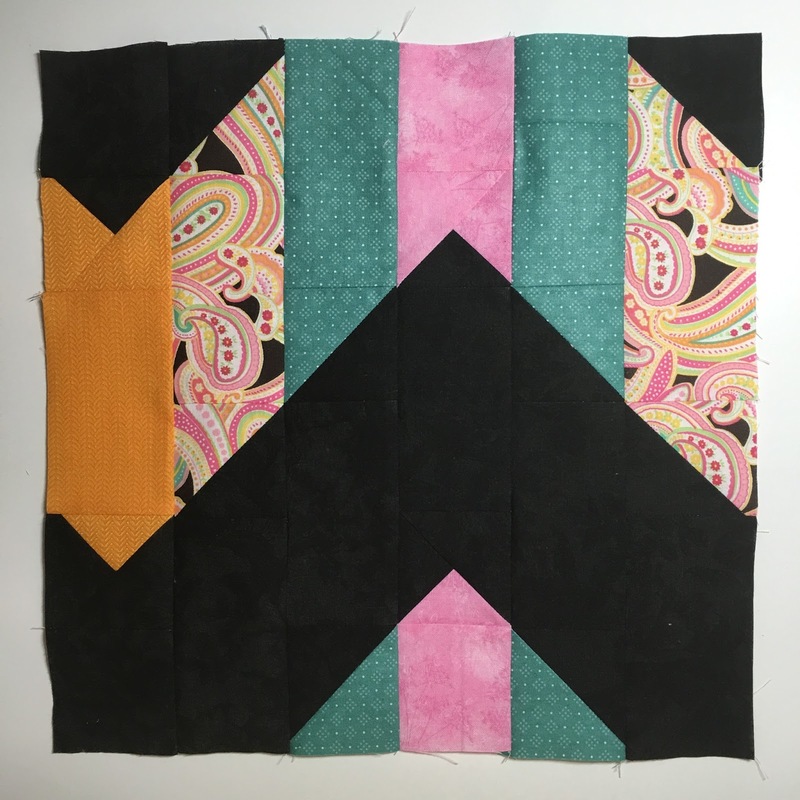 This is the last day of the blog hop sponsored by Quilty Pleasures but you still have time to gather ideas, inspriration, and enter to win your FREE copy of Quiltmaker's 100 Blocks Volume 12 issue. 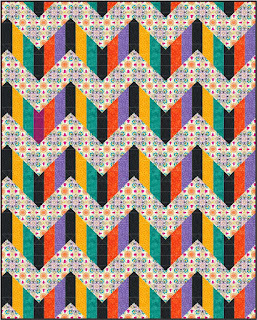 Just leave me a comment and tell me if you've ever made a block from ANY of the Quiltmaker's 100 Blocks magazine issues. Then use the rafflecopter to enter your name in the drawing. The complete line up for day can be found here. 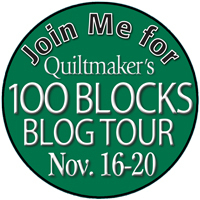 I hope you enjoyed your stop at my blog in the Quiltmaker's 100 Blocks Blog Tour. I do hope you stop back in soon. There are lots of things being planned for 2016. 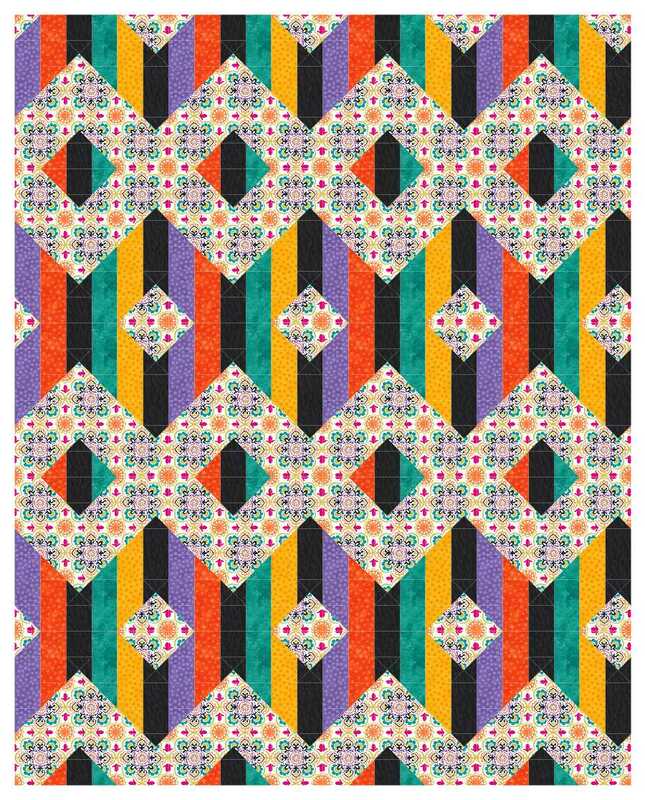 I'll be hosting my first Quilt Along with Kinship Quilters using my very own pattern "Traffic Jam". Kinship Quilters will be offering it in 3 color ways. I'll have more details in a blog post after Thanksgiving. I haven't made a block yet but would love to have a copy of the newest magazine! I haven't, but there are loads I'd love to make. I have not made a block from 100 Blocks, yet, but it is on my bucket list! Not yet but I see several that I like. So far I have not made any of the 100 blocks, yet. I have made several blocks from Quiltmakers 100 Blocks, but don't recall the names. They have been for block swaps and a sampler quilt. 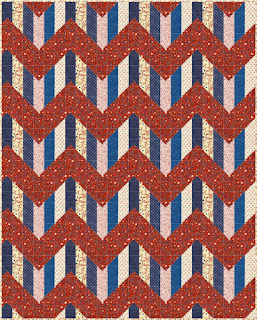 I can see using your block as a scrap buster, and your patriotic colorway would be perfect for a Quilt of Valor. I love your block! So many variations! I have made one Block so far from an older edition. The sheep with the flower in its mouth. Still love it very much! 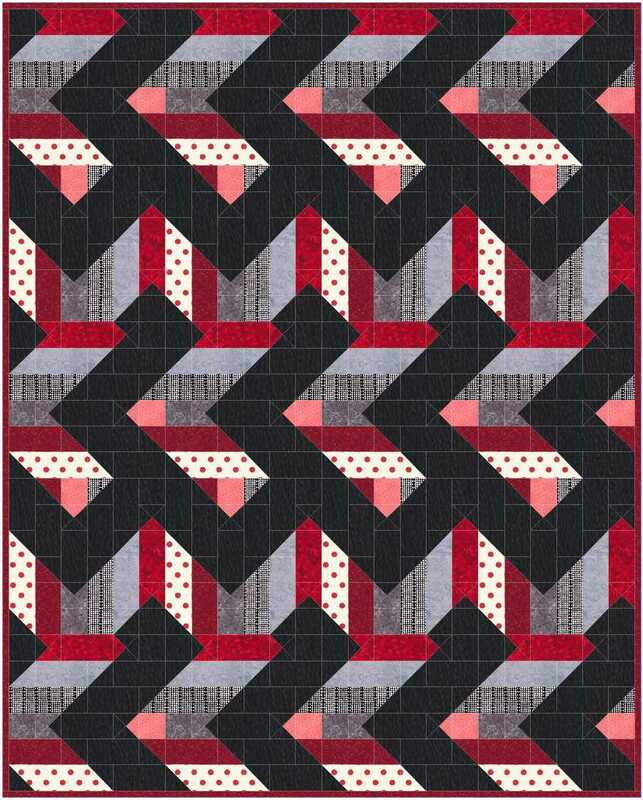 I haven't made any Blocks from Quiltmaker, but I will be making several once I pick up Volume 12! I love how you showed so many ways to set your block. I have not made a block from a 100 blocks mag but I plan to this year. If I don't win a copy, I will buy one:). I haven't yet but have the fabric to make three blocks. Just need the time to get at them. Yes, I have made several of the blocks. I have all the issues. No not yet , but so many are on my to do list. Not yet, I have one magazine, bought in the USA. In the Netherlands you can't buy the magazines. Love your block! That is a great versatile block. Yes, I have made blocks from previous Quiltmakers. It's a great block and you did a nice job with your blog. I loved seeing the other rotations of block layout. I haven't made any of the blocks, but I love browsing through the pictures. Your design is great! I make many string-pieced designs and this is a new way to set them. I made a Christmas-themed block from last fall's anthology. I really enjoyed seeing how you manipulated your block. I see it in my future projects. I have not made a block yet, but I frequently browse through my copies looking for inspiration. Your block is very unique and offers lots of possibilities. Yes, I've made a few blocks from the other issues. Not yet but it is very inspiring! I made a Christmas sampler quilt using all blocks from a couple editions of the 100 Blocks Magazine. It still needs to be quilted, but the top is really pretty! I haven't made one yet, but looking at these blocks has given me so many ideas! I've made quite a few, it's always fun to look through them for inspiration. I have made quite a few of the Quiltmaker designer blocks. I love seeing all the fresh ideas. Love your block. Thanks for sharing the different colorways & layouts. I've used a couple of the blocks from the 100 Blocks magazines. Thanks for the chance to win. I've haven't made one yet but have seen several that I can't wait to try! Congrats! I have made a bunch of blocks and even a quilt or two from things I found in past issues of this magazine. I'd be hard pressed to tell you which issues though, as there is such a huge number of blocks! Love your block and the alternate settings are very interesting. 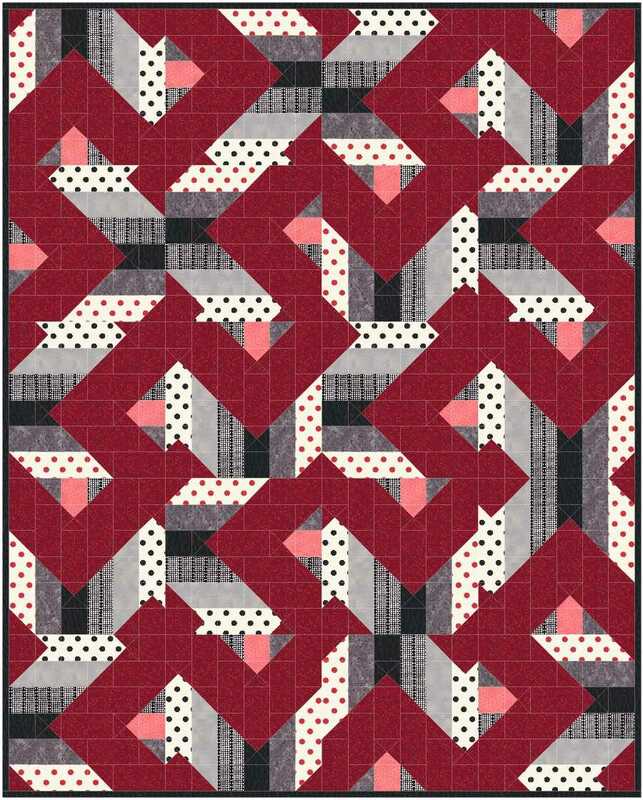 Yes I have and love all the QM 100 magazines, it is the first place I look for quilt ideas. I've made quilts, pillows, pillowcases, laptop envelopes and purses from blocks featured in QM 100 and have been inspired to make many more. I only have one of the issues, and I haven't made a block from it yet. I have several pages marked to make. I have not made a block from the magazine because I do not own any copies of the magazines. I have to depend on others to take me to the store and the stores are always sold out before I can get one. Like your block and the different versions of it. It looks so neat and trim. Good job with the designs. Nope! But, it's going to be one of my personal challenges next year. I want to make a block or two a month -- specifically from the magazine(s) themselves. I love how you showcased this block in a variety of settings! I did a block for my son… can't remember which volume. It was a red stapler (it was a block from front of that particular issue), because that's what he wanted for Christmas last year was a stapler… yeah, don't know… I don't get it… you should see what he does with a box of paperclips…. forget legos LOL! Great looking block, Doris. I am really loving the flipped block layout. The quilts are stunning. I haven't made any of the blocks from the magazines yet.I only have one copy. Hope to get started on some of them soon. Thanks for the giveaway. Wow! What a terrific block! No, I haven't made any of the blocks from the magazines yet but I do love to page through the magazines and dream! I have not made a block and I have every issue of 100 Blocks magazine. My intentions are good, somehow I just get sidetracked. I have several of the volumes, but have not made any of the blocks yet. Cool block--love all the possibilities! I own every issue of 100 Blocks, but have yet to make a single block--my bad! What an interesting block with great options! 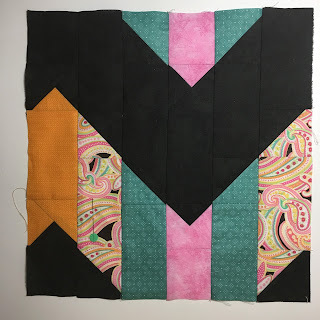 I have made several projects with blocks from Quiltmaker's 100 Blocks. I have all of the previous issues and enjoy viewing them for inspiration. Yes, I have made several of the blocks. I use them to make 12" wall hangings. I love to look thru all my copies for new ideas. Love all the possibilities with your block!! You would never know it was the same block - fabulous!!! I have made some of the blocks from previous issues of Quiltmaker - always fun! Yes, I have made blocks from the 100 Block issues. Thanks for all the ideas on how to set your block. I haven't made any blocks yet, but plan to do so from this year's issue. I haven't but I have promised myself that I will. Thanks for the giveaway. Great block, Doris! I like the wild and crazy layout best, too! And your Bitty Block is really cute. It's been a pleasure being a Scrap Addict with you! I've made 180 of the bow tie bitty block-they're all going into a queen size quilt. But I absolutely love the pumpkin bitty block you designed - it's totally on the "make next" list! I have made several blocks of 100 blocks love them?! Yes, I made one from one of the earlier books can't remember which one though. 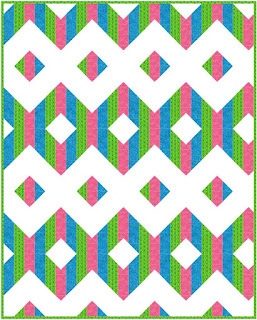 I like your bright colored flipped block pattern as well as your little bitty block. Thanks! Love the 100 block books. Fun block! I'd love to see the fabric you used for your background. The movement is amazing!!! My email is Karyntsh @ gmail dot com if you want to send a picture (please include your blog name so I can find you again and match it up). Thank you! Oh my goodness - I've made lots of blocks from past volumes. Snowmen, birds, deer, bunnies, flowers... Mostly applique minis. I have every issue but one - LOVE em! I have done one block from I think #9 a while ago, couldn't find the issue to name it. I love so many of the blocks that I may be making them for years. I used about 5 different bird/birdhouse blocks, along with some flying geese strips to set them apart. It turned out darling! I haven't yet made any blocks from the issues, but some are on my to-do list! I have made several of the blocks. I would like to make a whole quilt someday. I've made a few of the blocks. 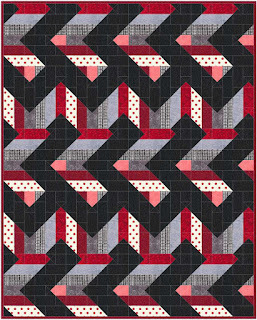 It would be fun to make a sampler quilt with several of the blocks from one issue. Yes i have made blocks from the books! MY favorite was a beehive and bees? I love all the different layouts and how versatile your block is. I made a sampler quilt using blocks from the different 100 Blocks books. It was fun browsing to find each block. I've made a couple blocks from previous issues. I love the inspiration! I have made 2 from the magazines. I really enjoy looking through them for ideas! I love quiltmaker 100 block issues thanks for the giveaway!Have made one of the appliqué blocks. I've used several of the blocks to teach new quilters - I had them make a simple block then add borders. A quick and nice finish. I have not made any of the blocks, but I am quite inspired by them. I look forward to having the time to sit an sew soon and you can be sure that I will try a few of them. Oh yes, I have made several. I have enjoyed the ones several years back with embroidered snowmen on them. Made a cute table runner! 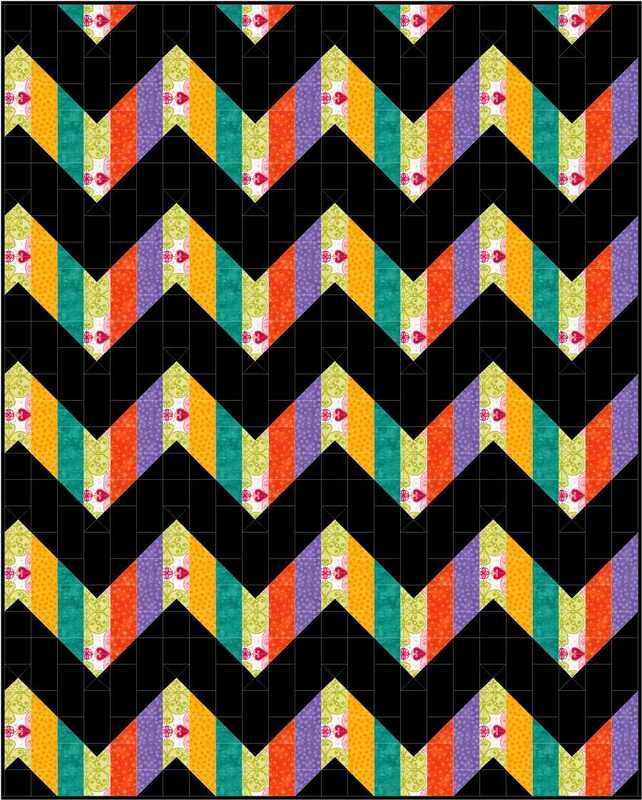 I've made a quilt from the Quilts from 100 Blocks: "Diamond Daze". I've made Crossed Diamonds. And last tour, I won the kit to make Blue Ribbon Quilt's block-all precut with Accuquilt--it was fun to piece and appliqué. 100 Blocks tours are so fun! Way to go, keeping a secret for so long! I have made several blocks from previous issues. I made a sampler quilt, and the 100 Issues magazines were treasure troves of ideas. I love your block. 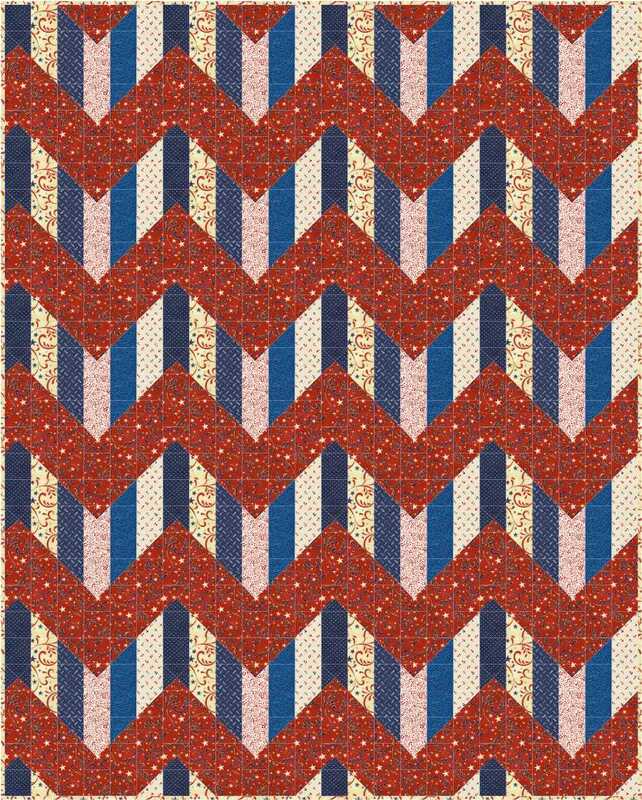 I really like the chevron pattern for quilts. I have made several blocks from 100 Block magazines. They are fun. PS - love the bitty blocks too! Though I have a couple of volumes of 100 Quilt Blocks, I must admit that I have never made any of them. I've never made a block from a 100 vol. 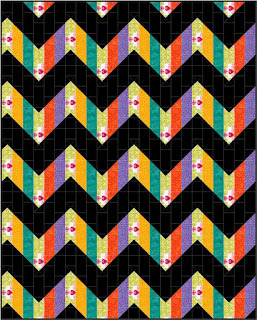 block quilt magazine. I've made several! It's a great place to get ideas for swaps and samplers. I have all of the previous magazines and I have made blocks from them. 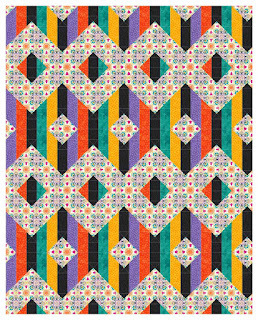 I like you 1st quilt with the flipped blocks! I think I may have made one from an older issue, but not sure which one. Thanks for the opportunity to win. And I love the setting variety your block offers! I have not made one, yet. I see Charlie brown when I see your block. Love it. I have not, but i am going to as I have ordered this one !! Actually, I haven't, but I would love to win this book so I could try one. I've made a few and now that I am becoming more proficient I'm planning on going back through the issues I have to see what other trouble I can get into! I haven't made a block yet but I will after seeing your block! What a great design and its so colorful! Thanks for the giveaway! Hugs array-dawn at cox dot net. Haven't made any so far, but it's nice to dream and plan! I've made a few from the earlier editions but there are only so many hours in a day to devote to dreaming. I have an earlier edition but haven't made one as yet. I haven't yet, but hope to after Thanksgiving!